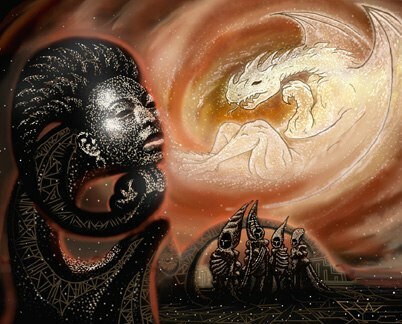 For the story "Cloud Dragon Skies" by N. K. Jemisin for Strange Horizons. In this story, the earth's atmosphere has become damaged (hence the color), and our heroine imagines dragons in the swirling clouds. I picked up the racial and cultural (African and Native American) visual motifs in the story to do the illo. This piece was nominated for the BSFA (British Science Fiction Award) for best artwork of 2005, though - alas - it didn't make the final ballot.